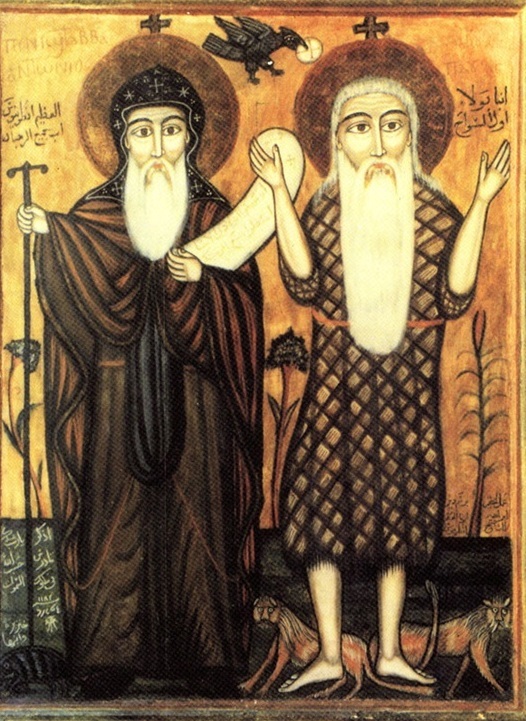 The Christian and monastic tradition know many remarkable men and women who searched for God and found Him too. Enough to be driven forward to continue to search into Gods fathomless depth. In their burning desire, they are the pacemakers for contemporary searchers. On this page, you will find some of them. From the 3rd century onwards many Christians distanced themselves from a worldly lifestyle. They ‘fled’ into the Egyptian desert to lead a quiet, prayerful and hidden life. A naked existence that yearned for a continuing connectedness to God. For this purpose, they commenced the struggle with their own passions and demons. 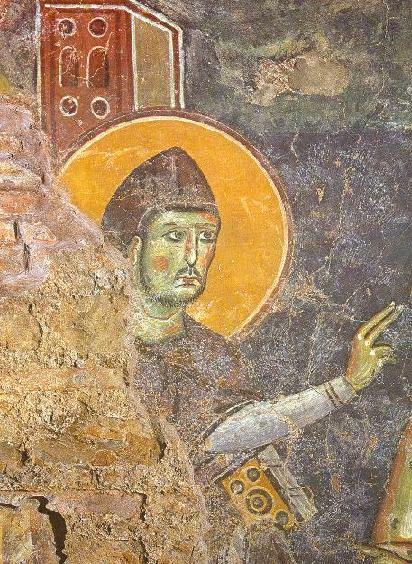 Abba Antonius was among the first to exploit the desert as a finding place of God. The final phase of his life was irradiated by divine light. He is honoured as the father of monks. Let those of us who are called exert ourselves and let this not be a burden because our Lord is a guide for all who aspire to virtue. To prevent it becoming too much for us, the blessed Paul has been given us an example. He said: I die daily. Should we bear in mind that today we have to die, we would no longer sin at all. It is in this sense that this word by the apostle should be explained, namely that we imagine in the morning that we will not reach the evening and, equally, that we imagine each evening that we will not make the next morning. If we guard our spirit like this and live with this thought, sin does not have to overpower us and lust will quail and not rule our life. Do not persist in anger towards the neighbour and offer forgiveness to those who misbehave. Benedict was born around 480 in Nurcia (Italy). He studies Literature in Rome. He had seen enough of the way of life practiced there, left everything behind and withdrew into a cave in Subiaco. Here he lived for three years as a hermit, alone and silent. Later on he founded his own community in Monte Cassino. 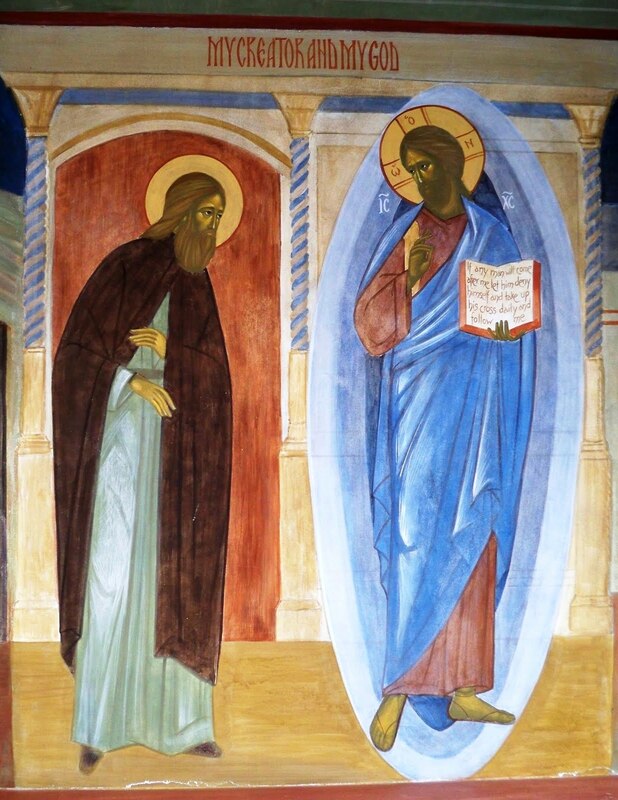 He is called the father of Western monasticism. The rule of Benedict is ascribed to him. 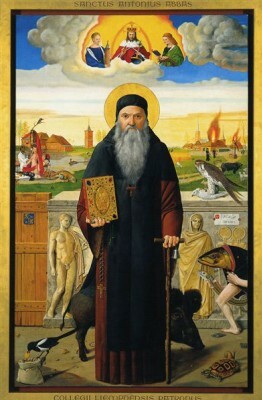 Bernard, born in 1090 in the area of Dijon, became a monk at the age of 22 in Citeaux – a strict reformed monastic way of life following the original Rule of Benedict. Already at the age of 25 he becomes abbot of Clairvaux, a daughterhouse of Citeaux. 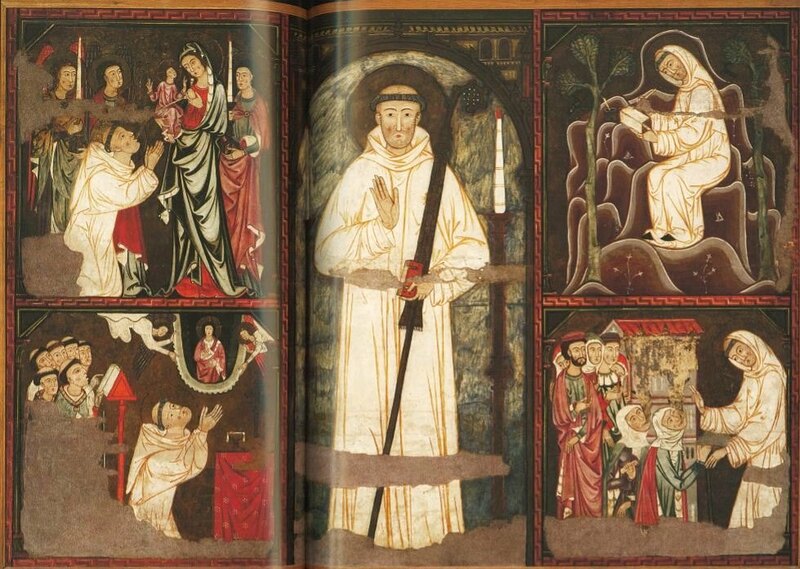 Under his influence and animation cistercian life flourishes in the 12th Century. The order of Citeaux counts at his death an enormous amount of monastries. He wrote many tractates among which his masterpiece: a commentary on the Song of Songs. Christ, the Word from the beginning, takes central place in his mystical theology. The Word became human to marry humanity and bring it back tot he Father. This is what you are urged to do by the goodness of him who anticipates you, who sought you, and loved you before you loved him. You would not seek him or love him unless you had first been sought and loved. Not only in one blessing have you been forestalled but in two, being loved as well as being sought. For the love is the reason for the search, and the search is the fruit of the love, you may not suppose you are sought to be punished. You are sought so that you may not complain you are loved in vain. Both these loving and manifest favors give you courage, and drive away your diffidence, persuading you to return, and stirring your affections. From this comes the zeal and ardor to seek him whom your soul loves, because you cannot seek unless you are sought, and when you are sought you cannot but seek… In this — not only has he sought me as I am, but he has shown me tenderness, and caused me to seek him with confidence. How can I not respond to him when he seeks me, since I respond to him in tenderness? How can he be angry with me for seeking him, when he overlooked the contempt I showed for him? 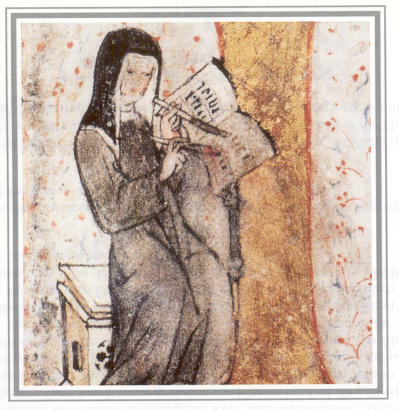 Cistercian mystic (Tienen, °1200), prioress of the abbey Our lady of Nazareth in Lier. Writer of ‘Seven Manners of Loving”, a well advised treatise that needs some elucidation. Here are two excerpts: from ‘the first’ and ‘the fourth’ manner. To be read attentively. “Sometimes it happens love is sweetly being awakened in the soul and happily rises, and moves in the heart, without any help of human effort. And thus the heart is being tenderly touched by love, and, full of strong desire, is being pulled inside love, and so wholeheartedly seized by love, so strongly dominated by love, so lovely embraced by love, that she is completely conquered by love. 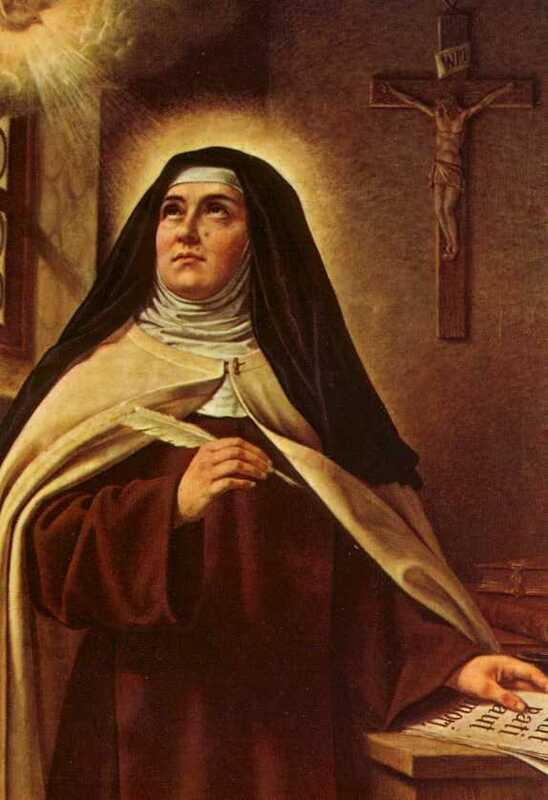 Born in a devout family of 12 children, she entered when she was twenty years old into the Carmelite Order in Avila where she, during a serious illness, saw her life before her: “I clearly saw that I did not live but fought with the shadow of death”. After her inexplicable healing she knew a time of spiritual dryness followed by a time of exceptional graces. The great Teresa is one of the most famous mystics the Church may possess. Her experience and teaching on prayer remain to this day a source of inspiration and animation. Together with John of the Cross, she reformed the Carmelite Order. Mental prayer in my opinion is nothing else than an intimate sharing between friends; it means taking time frequently to be alone with the One whom we know loves us. God called me, but I followed the world. I found the things of God beautiful but through the things of this world I was bound. How come I suffered so long because of this without letting go of this one or another? In the struggle it is detrimental to be alone. To people who venture on the way of prayer I therefore advice to look for friendship and relationships with others who also pray. It is good to continue shoulder next to shoulder. that you will receive union with God. believe me when I tell you that you did not achieve union with God. Ask the Lord to give you perfect charity. The foundation of all charity remains the gift of yourself. God cannot give Himself in fullness unless someone also gives himself totally. Love is an arrow that shoots the will. then it will hit home. loaded with the greatest favours. 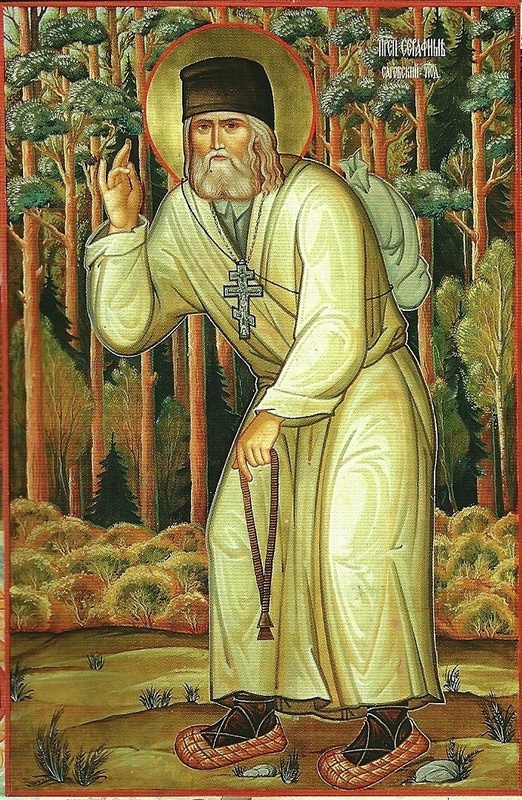 Starets Serafim is one of the most honoured and loved saints in Russia. His life and teaching still inspire many godseekers – even beyond the borders of confession and culture. In the West too he is seen as a great mystic. He had a strong devotion for the Mother of God and a special sensitivity for the working of the Holy Spirit. To him the goal of Christian life is ‘to obtain the Holy Spirit’. God is a fire who enflames the hearts and interior of the human person. If we see the coldness in our heart that comes from the devil – for the devil is cold – let us then search refuge with God and He will come to warm our hearts with perfect love, not only towards Him but also towards our neighbour. And the coldness of the devil will flee for His face. There where God is, there is no evil… God shows you His love for humanity not only when we do good, but also when we offend Him and deserve his wrath…. Do not say that God is just, Isaac the Syrian teaches us… David calls Him ‘just’ but his Son rather showed us that He is good and merciful. Where is his justice? We are sinners and Christ died for us (Homily 90). All who steadfastly put their hope in God, orient themself to Him and will be enlightened by the clarity of eternal light. If a human person neglects his own business out of love for God and to do good, knowing that God will not desert him, than his hope is wise and true. But if a human person gives himself too much to his own business and only directs himself to God when there are problems (when problems appear) and when he sees that he cannot be find a way through by his own means, then this hope is unreal and vain. True hope always seeks before all else the Kingdom of God, convinced that all that is needed in life for life here on earth will be given to him. The heart cannot live in peace before this hope has been acquired. Siloun was born in Russia in 1866. After a rather unsettled youth he went tot he Athos mountain (Greece) to live as a monk. He died there in 1938. Short after his entering he had a powerful experience of Christ. Moved powerfully by the gentleness and humility of Christ, he became a great witness of this. His whole life is a search for grace to make the humilty of Christ his own. How do I obtain grace, how do I keep it, and what makes me loose grace? He prayed in tears day and night for the salvation of all people. and made me recognise your love. My heart, found by You, is continually being pulled towards You. and give me tears to pray for the whole world. Lord, how could I recompense your love? My soul longs for the Lord and in tears I search for Him. How could I not look for you? You, after all, first desired me. and my soul loved You. You, o Lord, see my worry and my tears. then I would not look for You as I do now. and my soul rejoices because You are my Lord and my God. Many people pray aloud and prefer to pray from books. Their prayer is accepted too. He has mercy on all who pray. But the one who during prayer thinks of other things the Lord does not answer. If you only pray out of habit, your prayer is always the same. If, on the contrary, you pray with fervour and fire your prayer becomes multiform: you fight against the adversary, against yourself and your passions. But you always have to be courageous. As advice of experienced people, pray the Lord for humility and because or your humility He will give insight. The Spirit of God shows the soul when her prayer is pleasing to the Lord. 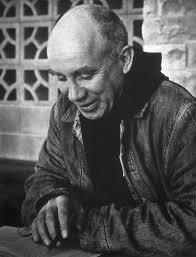 Thomas Merton – trappist of the abbey of Our Lady Gethsemani in Kentucky and a brilliant mind – a poet, writer, monk and hermit as well as an important writer in the 20th Century. Ecumenically minded he went into dialogue with important representatives of other religions. For many he is, until this day, a guide in their spiritual search. We should not go into the desert with the aim to flee from people but rather to learn how we can meet them. We do not leave them behind in order not to have to relate tot hem again but to discover in which way we can do to them what is the greatest good. But, in fact, this is never our first goal. The one goal that excludes all others is the love for God. How is it possible that people can live as if loneliness has no importance whatsoever for their inner life? True loneliness is not something that exists outside of the human person. It is not a situation where people or noises are absent. It is an abyss that opens in the centre of the soul. And this abyss of inner loneliness is a hunger that cannot be satisfied by any creature at all. The only way to find loneliness is through hunger, thirst, simplicity of spirit and a neverending longing. The person who has discovered this loneliness is empty as if he has been emptied by death itself. He went beyond every horizon and there is not one direction left in which he could go. He has arrived in a land where the centre is everywhere and the circumference nowhere. This land cannot be found through travelling but by staying where you are. In this loneliness the most essential actions happen. Here you discover how it is possible to be active in an inactive way, to work with intense trust, to keep vision in spite of darkness and – beyond every craving – to come to fulfilment without boarders. There has to be a room or a corner where one cannot be found and where one can be undisturbed or unnoticed. A corner where one is capable of disconnecting one self from the world and everything that binds human beings with gossamer threads or thick wires. Threads and wires that bind us with eyes, ears and attentionspan to the presence of others. If you found such a place be content with it and do not let yourself be drawn away from it through so-called good reasons. Learn to love it and go back there as often als you can and do not exchange it too quickly with another place. My loneliness, though, is not only mine for I see how much it also belongs to others and that I am responsible for it. Not only responsible for myself but also for others.Because I feel one with them, I owe it to them to be alone and when I am alone then they are not ‘they’ but my own self. There, there are no strangers! It seemed to me that I suddenly saw the secret beauty of their hearts, the depth of their hearts where neither lust nor self-knowledge can penetrate, the centre of their being, the person each one of them is in Gods eyes. Here the expression ‘le point vierge’ crops up again. I cannot find a good translation for it. In the deepest core of our being there is a point of ‘not-being’, where sin and illusion did not penetrate. It is the core of pure truth, the sparkle that belongs totally to God and that never becomes our disposal. The point from where God determines our lives and that is not open for the playfulness of our spirit or the brutality of our will. The small core of ‘not-being’, of ‘total poverty’, is the pure glory of God in us. It is, so to speak, His name that is written in us as our poverty, our neediness, our dependency, our filiation. It is like a pure diamant that derives its fiery glow from the invisible light from heaven. It is present in each one of us. If we were able to see it, we would see immeasurable points of licht that come together in the radiation and blazing of the sun that will make all darkness and cruelty of life completely disappear. I do not possess a programme for this. It is a gift. But the gate of heaven is everywhere.